Get 25% in coupon. Buy "Bolero Energy 7g" and get a coupon worth £0.11. 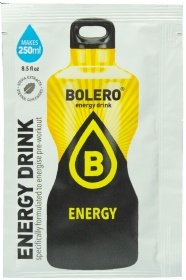 Get 20% discount in "Bolero Energy 7g" and save £0.09. Feeling slow and sluggish during exercise? Bolero has the perfect solution just for you... mix up a refreshing serving of Bolero Energy! Bolero Energy comes in an easy-to-carry sachet that you can bring with you anywhere you go – work, school, the gym, or on the road. This energy drink is all about keeping you hydrated and energized while sharpening your mind at the same, which makes it perfect for active people like you! How does Bolero Energy work for you? B vitamins for boosting energy production and fighting off feelings of fatigue! Caffeine for keeping your mind sharp and alert all day! Taurine for enhancing athletic performance and maximizing exercise output! Bolero Energy is suitable for those who follow the vegan lifestyle and it does not contain any added sugars, gluten, or GMO. Charge up your physical and mental performance in an instant... just fix up an ice cold serving of Bolero Energy! Have a question about Bolero Energy? What is it, what does it do, how and when to use or something else? Ask us. Dissolve contents in 250ml of cold water. WARNINGS Bolero Energy : High caffeine content. Not recommended for pregnant/lactating women and individuals under the age of 18. keep in a cool, dry place. Consult a physician prior to use if you have any medical condition. This product is not intended to diagnose, treat, cure, or prevent any disease. For use as a dietary supplement only. Keep out of reach of children. Food supplements should not be used as a substitute for a varied and balanced diet and healthy lifestyle.